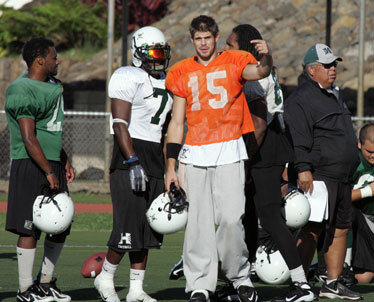 Hawaii quarterback Colt Brennan talked to slotback Davone Bess (7) at yesterday's practice. It's not every day that a team from the Western Athletic Conference is favored by two touchdowns over one from the Pac-10. But that's the situation tomorrow as 11th-ranked Hawaii (11-0) hosts Washington (4-8). The Huskies are the first team UH plays this season from one of the six major conferences. Warriors players say they are impressed with the speed and skill shown by the Huskies on tape, and coach June Jones said they're the best team on Hawaii's schedule. But UH is not in awe of teams from the power conferences, having beaten Arizona State, Purdue, Michigan State, Northwestern and Alabama in recent years. The phrase "Pac-10 talent" is getting thrown around in Hawaii as much as footballs at UH practices this week -- although not by the Warriors players and coaches. For them, it's just another game -- albeit a huge one. As the 11th-ranked Warriors (11-0) prepare for tomorrow's regular-season finale against Washington (4-8), coaches and players acknowledge the Huskies are a collection of talented athletes. But the Warriors aren't in awe, and they don't believe there's an ability gap between top mid-major teams and squads from the bigger conferences. Junior slotback Ryan Grice-Mullins said the fear factor is actually reversed. "We showed that at the beginning of the summer when they couldn't get enough top BCS schools to play us in the first place. That should tell you something there, you know? We're not worried about that," said Grice-Mullins, one of three UH players on pace to go over 1,000 yards in receiving this year. "Football is football. A game is a game. All you have to do is go out there and win, no matter who we play. Boise made the BCS last year and people thought we'd struggle against them. That just tells you it's the players and who wants it most." Several UH players are transfers from schools in BCS conference, including quarterback Colt Brennan (Colorado), wide receiver Daniel Lofton (California), defensive end Francis Maka (Arizona), running back Leon Wright-Jackson (Nebraska), defensive end Amani Purcell (Penn State) and defensive end David Veikune (Colorado). This is the first UH game this season against a team from one of the six major conferences. "I'm just looking forward to playing good Pac-10 competition," Purcell said. "I always wanted to play these guys. It'll be fun. I had a (recruiting) letter from them, but I don't really remember if they were trying that hard." Purcell said relatively lightly recruited players often become better players than the ones courted by the big-name schools. "Yeah, they may have more talent, but this year's Warriors team has a lot of heart. And that's going to be the big difference. They want to give their seniors a good last game, but we have a lot of seniors, too," Purcell said. "Yeah, I came from a big-time school and stuff, but the leader of our D-line is Mike (Lafaele), and he's always been here. There ain't no difference. It all depends on the person and his heart. Mike has the biggest heart." Brennan was sixth in the Heisman Trophy voting last year and is one of the top five candidates this year. He was so lightly recruited out of high school that he went to prep school before walking on at Colorado. Brennan and other Warrior players have often said they thrive on others doubting their ability. "Everyone talks about making statements," Brennan said. "What better chance to make a statement this Saturday against a BCS school?" Like his players, coach June Jones would rather have more facilities and a bigger budget. But he also relishes the challenge of playing against a program with more resources and -- at least as perceived by others -- higher-rated recruits. Jones said the Huskies are better than their record. "We line up against anyone we play and this is the best team we've played," Jones said. "On film, athletically, and we're going to have to show up and play our best game." Hawaii is 6-10 against teams from the major conferences since Jones' arrival in 1999, but has won five of the last 10 such games. The bigger the name of the opponent, the sweeter the victory -- when there is one. But as Grice-Mullins said, when the game starts it's just football, regardless of who's lined up on the other side. "This isn't the first Pac-10 team we've played," he said. "Arizona State last year in the bowl game. People saw what we can do in that game. And there were other games throughout the year, Purdue. It don't really matter to us. We just go out there and play who shows." Junior slotback Davone Bess was named a third-team All-American by Rivals.com yesterday. ... Jones and defensive coordinator Greg McMackin said starting safety Jake Patek will be ready to play tomorrow. "We're just being a little careful with him. His ankle felt good, he took reps (yesterday)," McMackin said. ... The Warriors practiced at the FieldTurf practice field at Saint Louis School, familiar ground for UH's Jason Rivers, Aaron Bain, Timo Paepule and Fale Laeli, all former Crusader stars. "Shutout," Laeli said, when asked to predict an outcome for tonight's state championship game between Saint Louis and Leilehua.